So, residents in my apartment complex have obviously not been informed that the unofficial rule is you’re not supposed to have large dogs in China. On our walk today around the property, we came upon the British Lawn, a large expanse of green lawn and trees-a really lovely oasis for us in the chaos of China, our very own small Central Park. This morning, and perhaps every Sunday morning, it seemed that the British Lawn had been turned into a Shanghai Dog Park, complete with one guy driving his pooches crazy chasing after a remote controlled car all over the greens. Super funny to watch Mr. Golden Retriever run ragged chasing the car until he finally said F*&K It and stopped, panting with his tongue hanging out. Where’s my water, Mr. Owner??? Unfortunately, our new rescue dog, Thor, is teeny tiny and still waiting for to get all his shots so he won’t be seeing the light of day or playing on the lawn any time soon–maybe next summer, Thor! 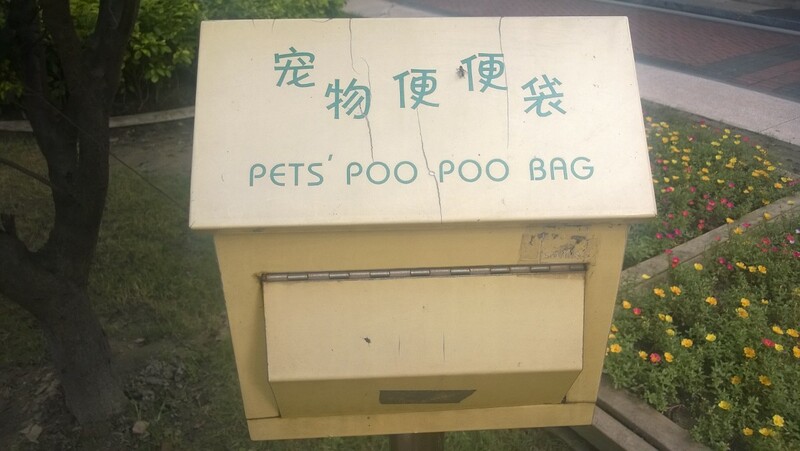 Now, the complex does provide a container to provide Pets Poo Poo bags, but, of course, it was empty. Thus, the pooches do their business whenever and wherever they want and the owners don’t really police it. Watch where you step! Take off those shoes at the door! The Property “RULES” state: “Do not walk your pets on the lawn.”. I guess if no one uses a leash and lets their dogs run wild, it’s technically NOT walking your pets. 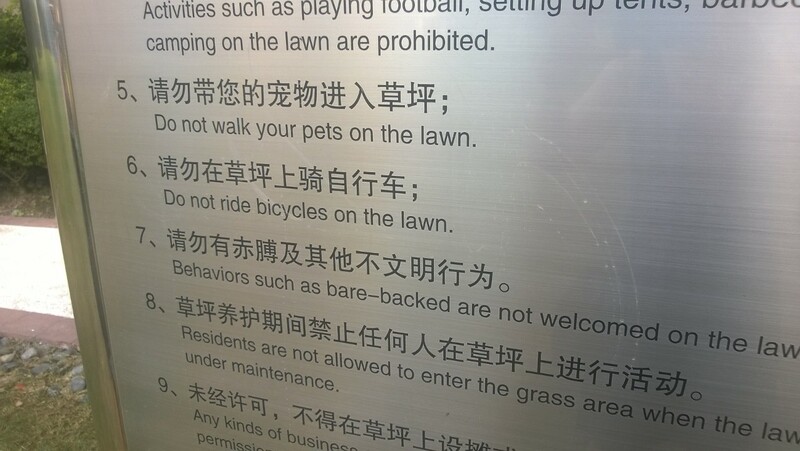 Oh, and I have no idea what this rule means but am dying to find out: “Behaviors such as bare-backed are not welcome on the lawn.”. Hmmm…. could mean so many things if you think about it, all interesting. I guess I’ll have to walk around more looking for bare-back activities..more to come.